So, I did two brewings - one with 70/30 water, and one with regular tap water. 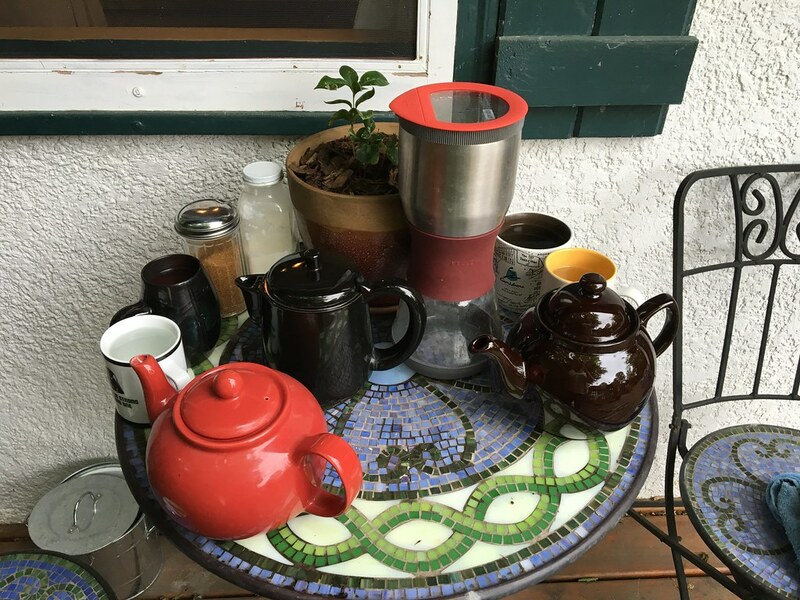 Instead of 26 ounces of water, I did two batches of 14 ounces each (red teapot had tap water, and brown teapot had 70/30 water). I then ground a little more coffee than usual (nearly 6 TBS, instead of 5), and split it between the two brewers. I brewed using my normal Duo parameters (40 seconds of bloom, add the rest of the water, wait one minute then stir, wait another minute and stir, then wait 2.5 minutes, and halt the brew cycle) in both brewers. The Sowden Softbrew (black pot on the left) is an immersion brewing method very similar to the Duo Coffee steeper. In both, the grounds soak in the brew water for a prescribed amount of time, and then the water either drains from the grounds, or you lift out the filter basket, removing the grounds. There are differences in the end result between the two methods, but they are the closest I've got to the same brew method. Anyway, one coffee was definitely better than the other, but here's the embarrassing part. I lost track of which coffee was which. Ah well, I'll just have to do it again tomorrow.